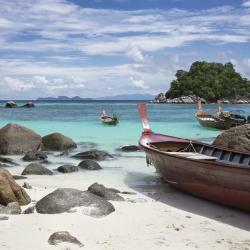 Looking for hotels in Ko Lipe Pattaya Beach? Located in Ko Lipe, within 1.1 mi of Lipe Floating Pontoon and 1.4 mi of Military Camp, Lipe Banyan Apartments offers barbecue facilities. All rooms boast a kitchen and a private bathroom. The room was fantastic, although we didn't use the kitchen was brand new and fit for anyone staying for longer and planning to prepare own meals. The bed was possible the best I have slept in the last 6 weeks traveling. Despite being slightly hidden away from beach front it's right at top corner of beach giving the perfect excuse to walk the beach in the evening and visit bars or restaurants. Excellent place. Located in Ko Lipe, Family Song Bungalow features a beachfront restaurant and comfortable bungalows located 328 feet from the beach. It also offers free WiFi access in all guestrooms. The place is quiet and relaxing, good for those who seek serenity and reflection. Located an 18-minute walk from Lipe Floating Pontoon, Forra Pattaya Beach Front Bungalow provides accommodations with free WiFi in Ko Lipe. Providing free WiFi, Zodiac Beach Resort is located in Ko Lipe, within 1.1 miles of Lipe Floating Pontoon. Featuring a 24-hour front desk, this property also provides guests with a playground. Next to beach, clean room and great location. Boasting a beachfront location, Akira Beach Resort is placed along the Pattaya sandy beach,a 5-minute walk to the walking street. Staff was incredible and so sweet, especially Adam, Teng, and Jhoana. The property was unbelievable and had a wonderful location. The breakfast was great, drinks were perfect, and ocean view bungalow was beyond words. We couldn’t have had a more wonderful stay!! Located on the western end of Pattaya Bay in Koh Lipe, Forra Dove Resort Pattaya Beach offers peaceful bungalows with tropical garden. Staff was great, super nice and helpful, we also went on their diving trips. Great access to Pattaya Beach and a small hidden beach nextdoors, which was great for snorkeling. Bungalow was nice and spacey! Walking Street Hostel provides accommodations with free WiFi in Ko Lipe, located conveniently a few steps from Lipe Floating Pontoon. The property is located a 13-minute walk from Military Camp. It is one of the most budget places in koh lipe, very close to the beach and very easy to get to from the pier. AC very very cold (like you need a sweater cold). Nice blackout curtains. Access to the very nice pool that is pictured. Quiet at night for the most part. Big lockers. Located in Ko Lipe, a few steps from Lipe Floating Pontoon, Charming Lipe Villa has a terrace. Featuring a tour desk, this property also provides guests with a restaurant. Beautiful place to stay, close to the beach and very good breakfast. The room was amazing.